People often ask us why a minivan camper? Especially since we already own a 28 foot Jayco travel trailer. Let me explain why. Our adventure into building a minivan camper began with a trip, a very long trip, a 22-week trip to be exact. On that trip we drove across the United States and into Western Canada in a red GMC Sierra pulling a 28 foot traveler. We explored many National Parks along the way as well as beaches, cities, museums, and restaurants. We took our three children with us who were at that time 14, 16 and 21. It was a trip of a lifetime. It was a trip that grew the desire within my husband and me to see more of the beauty of creation. We knew when our feet hit the front doormat of our home after 22 weeks of travel that we wanted to explore more. 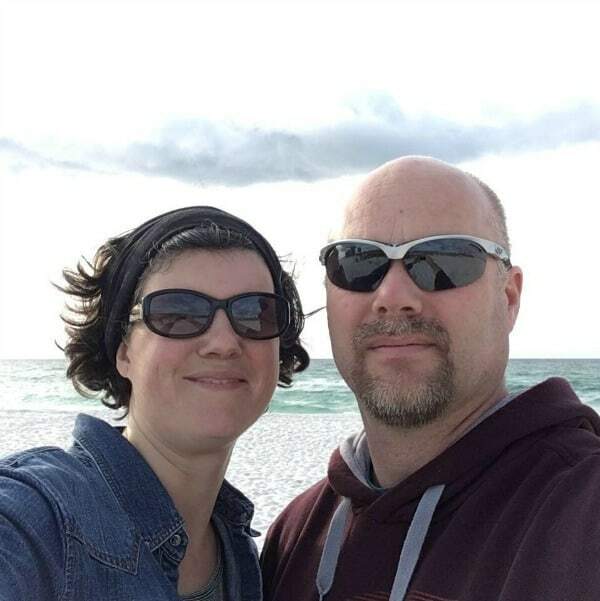 We wanted to get out there–and not just on the three weeks off my husband has each year from his job as an RN, but at least one weekend a month too. However, our current income versus expenses doesn’t allow for that much travel–at least not doing it the most popular way where you stay in hotels and eat every meal out. And so like always when I am faced with a problem I want to solve, I laced up my running shoes and I hit the ground running, trying to figure out how to fit more travel into our budget and our daily lives. My husband Jack and I on our first minivan camper trip to Pensacola, Florida. During one run I was listening to the audiobook Nomadland: Surviving America in the Twenty-First Century and the author mentioned a subculture of people who live full time in their vehicles as well as a Youtube channel called CheapRVliving and in that very moment the beginning of an idea was planted in my head. Later that day I got on the CheapRVliving channel and the first video that popped up was a tour of a lady living full time in her minivan. 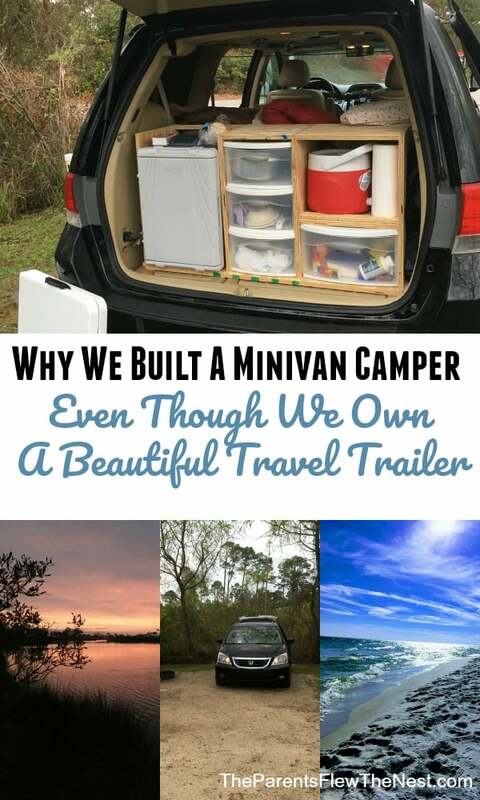 She called it a minivan camper and those two words began an afternoon of hopping all over Youtube, Pinterest, and Google looking at pictures, videos and blogs of minivan campers. By the time my husband got home from work, I was convinced I had found the solution to our desire to travel just the two of us inexpensively one weekend a month. 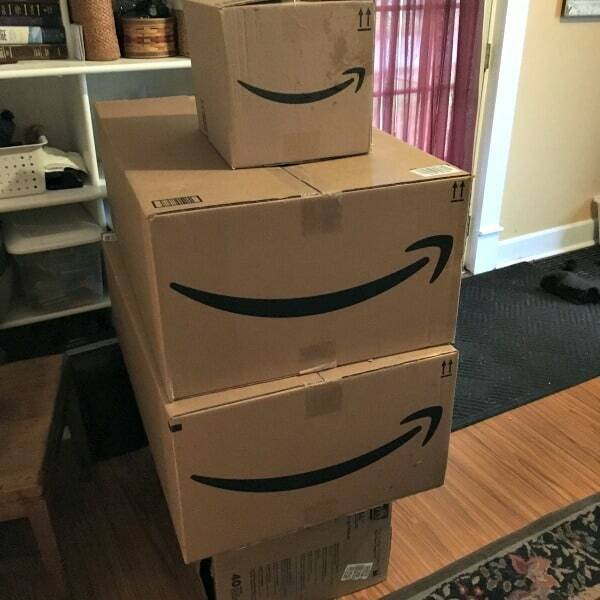 Our first order from Amazon full of minivan camper supplies. We can camp either for free in our minivan using recommendations found through the All Stays app or we can pay a reasonably small fee for a State Park campsite if we want to. Although my husband and I do own a very nice travel trailer, it does have a few negative to it. If we can’t find a campsite available in the area we want to explore, a minivan can be parked at Walmart or another free camping spot. Yes, a 28-foot traveler trailer could too, but it isn’t as easy to find a place to park it during the day while you go hiking. Hiking trails have perhaps half a dozen regular sized parking spots at their trailheads at best. Our truck and trailer parked sideways across those parking spots would take up all of them, which isn’t allowed, and even if it were, we would not do it because it would be rude. One last problem is that we live in the midwest where it gets cold enough in the winter to require us to have to winterize the travel trailer’s plumbing. We also like to cover it with a heavy duty tarp before the first snowfall to avoid any damage freezing and thawing snow may do to its exterior. Once those two things are done, it would be a pain to undo them for a weekend of camping only to redo them when we got home. Our agreement to our children has always been that when they hit the college years, we would provide them with free room and board and a vehicle to drive to and from class–they have to come up with a way to pay tuition. Up until lately, we had been surviving off two vehicles since I work at home and Thomas takes college classes online. However, since Thomas got a job this spring and Aiden started college at a campus nearby in June, a third vehicle became a need. 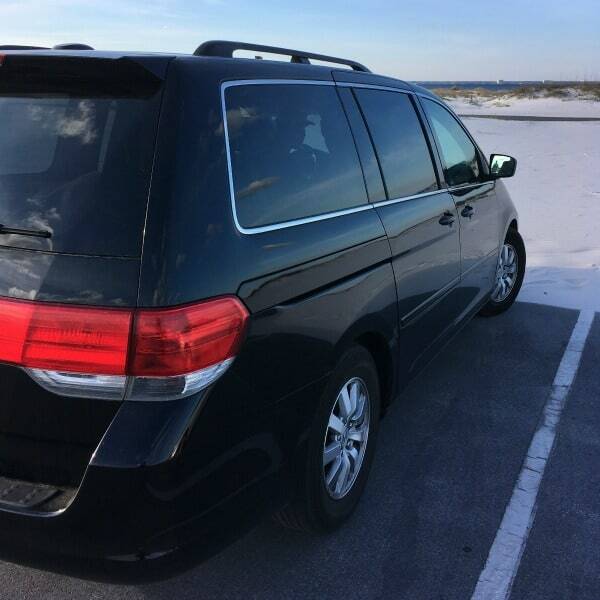 Our new to us minivan on her first trip as a camper to Gulf Shores National Park in Florida. With our minds made up to buy a new to us minivan and convert it to a minivan camper, we began researching what brand of minivan would be best. We were looking for good fuel economy, reliability and a little bit of style (can a minivan have style?). After comparing the data and asking for recommendations from friends, we decided to go for either a Honda Odyssey or a Toyota Sienna. In the end, we purchased a black 2009 Honda Odyssey with just under 150,000 miles on it. We have friends who have one with over 300,000 and theirs is still kicking so we hope ours lasts that long too. However, so far we have not been so blessed, ours has required extensive repairs over the last few months. Hopefully those will soon come to an end. 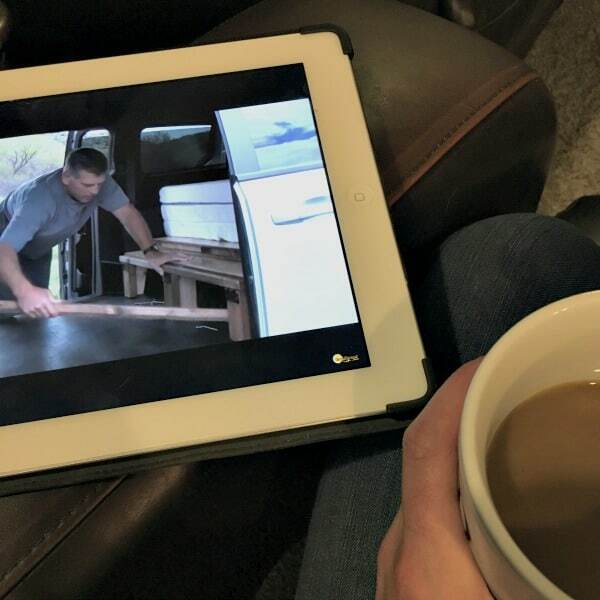 While we were minivan hunting, I became obsessed with Youtube videos on converting a minivan into a minivan camper. So much so that I started a Google Drive folder with documents marked “kitchen ideas,” “storage ideas,” and “bed ideas” and in each were several links to YouTube videos sharing my favorite ideas for each component of the build. In the end, we took a bit from each plan and created a build that suited us best. Making lunch after a morning of hiking in Blackwater Falls State Park, WV. As I write we have already taken the minivan camper out two times. Once when it was half built and once when it was fully built–well, almost. The second trip ended with us making a list of things we want to change. I have a feeling though that every trip will end in a similar list. Currently, we are in the hot summer months here in the midwest so we are using our travel trailer with its air-conditioning for our weekend trips. This does mean we have to plan our weekends away a bit more in advance and that we have to be flexible about what State Park we visit so we can be sure to have a camping spot, but we are pampered people who love our cold air for sleeping at night. However, we plan to winterize our travel trailer after our October trip and then use the minivan camper for our trips from November until May. 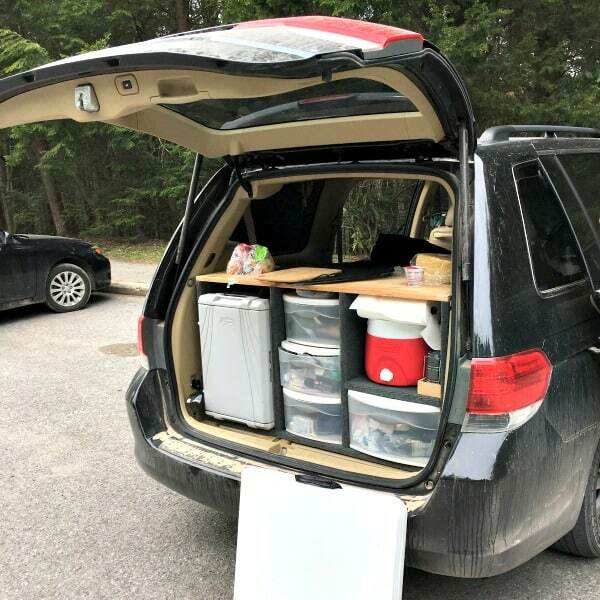 I have plans to write an in-depth post sharing all the details of our minivan camper conversion. For now, the picture above is a sneak peek at what the trunk kitchen looks like.